Voted #1 Food for Bettas! 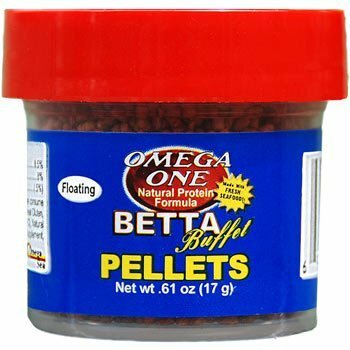 Omega One brands of fish foods are amazing and this one is designed specifically for betta fish. FEEDING: Your guide to supplying your Betta with a healthy, nutritious diet. These fish are carnivores, and prefer live or frozen foods to anything else. It’s more nutritious than pellet or flake food, and produces less waste in the tank. If you can get live foods, use these as often as you can. A varied diet is important to your Betta’s health. Do not overfeed your fish. Firstly, this will foul your water. Dirty water is an open door to illness and poor Betta health. 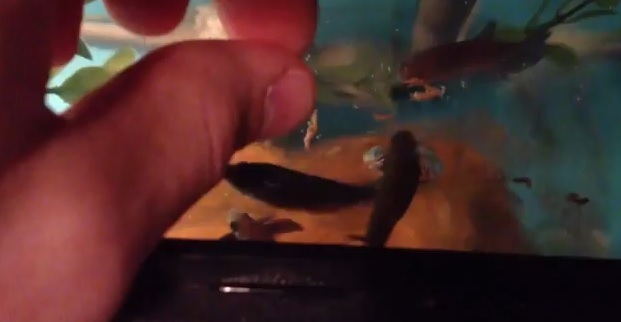 Secondly, a Betta’s stomach is also very small. It’s only about the size of their eye. You should feed them no more than a pencil eraser-size portion of food at a sitting. You can feed your Betta once or twice a day. If you feed them twice a day, cut the amount in half that you would normally feed them at one time. Example: if you’re feeding pellets twice a day, feed them 2-3 pellets at a time. Some individuals recommend not feeding your Bettas one day a week. This is optional to the keeper. The Bettas will do fine either way. These fish don’t typically respond well to pellet or flake foods, but most new or casual Betta keepers find this the most convenient route. Once they get a taste of live or frozen foods, they will usually turn their noses up at pellets or flakes next time you try them. I give my Bettas a diet of live brine shrimp, frozen bloodworms and pellet food. If you want to convert them back to prepared pellet or flake food after feeding them live or frozen, just starve them a couple of days and add pellets at that time. They will get hungry and eat them, and it doesn’t hurt the Betta at all to go a couple days without food. If you decide to feed a Betta frozen food, make sure you thaw it first. Take a small cup or shot glass and dip a bit of water from the tank into the container. Pinch of a small bit of frozen food and add it to the cup. When it’s thawed, pour off the excess water. You may then pour it into the bowl or dispense with a turkey baster. ¨ Worms: bloodworms, blackworms, glassworms and tubifex worms – live, frozen or freeze-dried. ¨ Brine Shrimp – live, frozen or freeze-dried. If you decide to leave on vacation and will be gone more than a week, you will need to have someone come over and care for your Betta while you are away. If you will be gone a week or less, feed him immediately before you depart and immediately when you return. He will do fine for a few days without food. Do not dump a bunch of food in his tank to last him several days. He will not eat it, and it will decay and foul the water while you are away. Also remember to do a water change before you leave and when you return to keep his bowl fresh and clean. If you are going to be gone longer than a week and have someone caring for your Betta, you will need to teach them how to properly feed him and change his water. I would also recommend writing it down on a piece of paper and keeping it near his bowl or taped to the fridge for their reference if they need to refer back to your instructions. Better safe than sorry. Topic: Is this where I can ask a question? Our beta used to swim around, rest on his pile of rocks (which are in a smaller glass bowl inside of his bigger tank) and be so much more active. Now, he spends most of his time floating at the surface of his tank (2.5 gallons), takes an occasional swim around the tank and then back up to the surface to float, (no movement) for most of the day. We use filtered water, clean once a week, recommended pellets for food. A good filter setup helps. We feed him 2-3 pellets twice per day but he rarely eats those until they’ve floated to the bottom a day or so later. We don’t have a heater but never have and he still used to be so much more active. His color is still good. Any recommendations? Thank you. First questions are: What is your average room temperature? The betta needs around 75 degrees Fahrenheit. I personally don’t recommend people to feed their betta fish pellets. It somewhat like you eating cafeteria food everyday.. just is boring and nasty. Try some dried bloodworms or dried shrimp and liven up his day a bit. Just wonder to yourself what he gets to do all day in his tank..? If you feed him the same thing everyday and he does the same thing… he is depressed. Spice up his life with some new things. Try putting a tiny mirror up to the aquarium for a while and let him flare up like he could be fighting another fish and have some new things step into his life. Or buy another betta fish and use a tank separator and let them see each other once and great while to add some value to their lives. I get this question on a daily basis and everyone thinks their fish is sick. These fish get bored out of their minds because they don’t have anything to do like they would in natural habitat… So it is up to their owners (we the fish geeks) to do cool things for them. I use a penguin 200 filter on my tank. I just found your website yesterday and having read everything I could, it seems I’m doing a lot more wrong than I am “right.” Our house temp is usually around 65 – 70 degrees (San Diego, CA). I’m getting him better food today per your recommendations, I set up his mirror as you suggested and also realized I was cleaning him wrong as well. I was completely changing all of his water, cleaning his tank and rocks as well. Now I know it’s 40-50% of his water so he won’t go into shock. I’m now surprised and grateful he’s alive at all. I inherited him and just went with what “they” were doing which I now know was 90% wrong. I can do better and will start today. Do you think I need a heater in his tank? Many thanks Christopher! I’ve been having the same issue with my fish.. A friend of mine told me to change things up for my fish once and a while like.. changing the tanks and maybe move around the decorations and such. I feel this made a huge difference for my fish and he is up and moving around happily again. If I could tell you any advice it would be to just move things around for your fish once and a while. Just like humans… these fish get bored too. Marimo Moss Ball with Betta Fish? - Is OK to Keep Together? Do Betta Fish Bite Hard or Can't they Hurt Our Skin? When Do Betta Fish Sleep With the Lights On? Want to Know More Aquarium Info on these Fish? Fade Color Loss, Fading Grayish... Betta Issue? Size of Tank, Bowl, Vase, or Aquarium for Betta Fish? Need More than One Female Betta Fish Together? Play Time, & How to Have Fun with Betta Fish? What Size Should Betta Tank Be?